Driving on highway 90 from Jerusalem down to the Dead Sea takes half an hour as you descend from more than 700 meters above sea level to 400 meters below sea level. The Dead Sea is situated at the lowest point on earth, in the Great Rift valley that runs from Turkey in the north to Mozambique in the south, in the crack in the earth’s crust created when Asia and Africa were torn apart five million years ago. 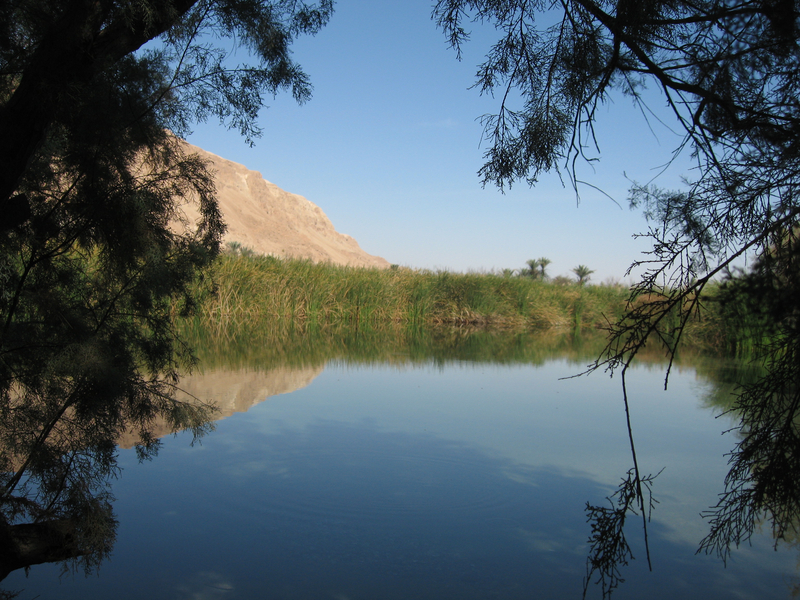 Originally it was an ancient larger sea connected to the Mediterranean when water flowed across the Jezreel valley and Jordan River to fill the rift. Although it has no outlet, evaporation in the hot Judean desert reaches 25 mm per day in the summer so in four days it loses the equivalent of the annual rainfall. 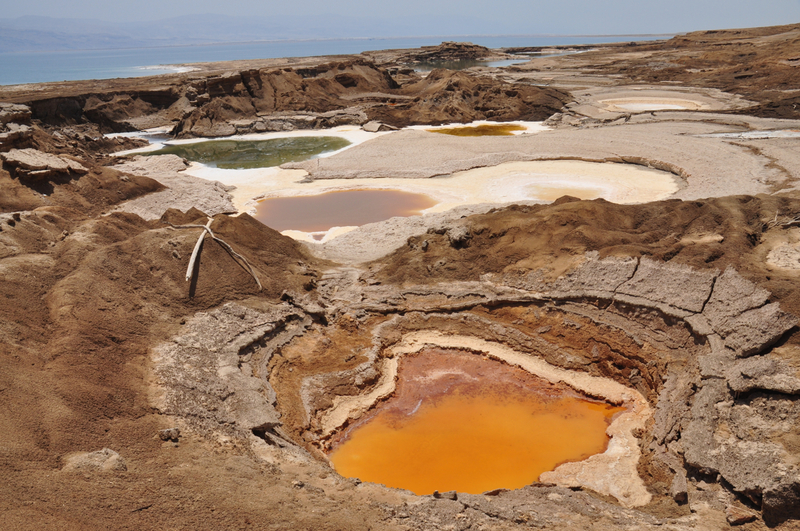 When the amount of water flowing into the Dead Sea from the Jordan River was equal to the amount lost to evaporation, 1.2 billion cubic meters, the level stayed in equilibrium. Today the Dead Sea is receding at the alarming rate of one meter a year as Israel and Jordan divert the waters flowing into it. The sea is still 1100 meters deep at the northern end so it isn’t going to disappear tomorrow but it is a serious problem that needs to be addressed. At Lido junction at the northern end of the Dead Sea I often stop to show people the replica of a Crusader map painted on the curved walls of what was a fancy Jordanian restaurant on the shores of the Dead Sea. The artwork was done in March 1973 by Kohavi, who served like me as a reserve soldier at the nearby “Hilton” hotel, now an Israeli army base. 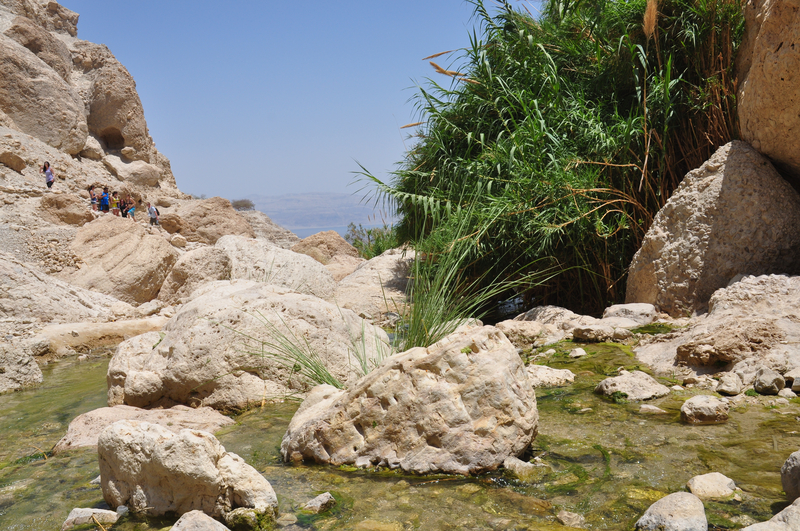 Here you can see the trickle that is the Jordan River today flowing into the Dead Sea. Continuing south along highway 90 we’ll pass some private beaches on your left where you can float in the salty water of the Dead Sea and cover yourself in mineral rich mud. The mud contains magnesium, potassium, sodium, bromide and calcium, all beneficial to our skin; in fact, as the mud dries it even draws out toxins from your skin. On your right we’ll pass Qumran where the Dead Sea scrolls were discovered in the nearby caves. At that time, Qumran was a land terminal, you couldn’t continue southward except by boat. The Dead Sea was an important transportation route because even heavily-laden barges would float easily (the Madaba mosaic map shows 2 such boats carrying salt and grain). On your left is En Feshka (also called Einot Tsukim). Excavations were carried out here in 1958 by de Vaux (when he was excavating Qumran) and in 2001 by Hirshfeld. The concensus is that this was a farm that prepared balsam perfume. Today it is a nature reserve, 1500 dunam of which has restricted access and can only be visited with an authorized guide like me. Just before we reach En Feshka look up on the cliffs to your right for the PEF markings, 2 black horizontal lines drawn in 1900 and 1927 by members of the Palestine Exploration Fund and the letters PEF in red. To help you understand how much the Dead Sea has receded these lines were painted from a boat floating on the Dead Sea in the 1900s. 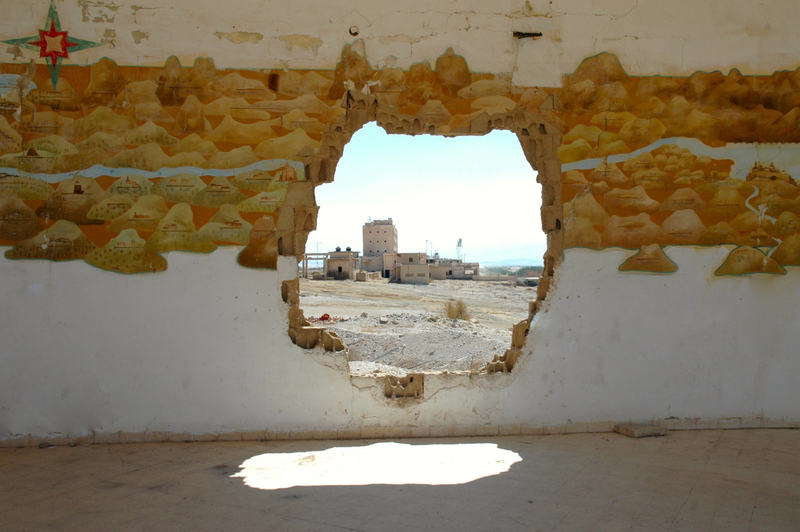 This entry was posted in Archaeology, Nature, Photography, Travel, Water and tagged Dead Sea, desert oasis, ecology, Ein Gedi, Palestine Exploration Fund on October 28, 2009 by Shmuel Browns.